cave expedition | Thunderman87's Club Penguin Cheats,Gltches,Secrets & More! Club Penguin Cave Expedition Closed Down! 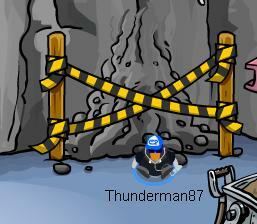 Today the Cave Expedition ended for now and Club Penguin has but Caution Tape at the Cave Entrance!Also the wall is back to the rock slide form! Take a look! pritty cool I can’t wait untill tomorrow so we can start the Cave Expedition! Are you excited like me? Tell me in a comment!